Median Renko bars are a modified form of the traditional Renko charts. Median or mean Renko bars offer an advantage of showing trends without the noise. You can learn more about the differences between Median Renko and traditional Renko bars in this article. The median Renko bar is available as an add-on plugin for Ninjatrader. Installation is fairly easy and quick and once the charts are loaded, you can start trading from the charts directly. In this article, you will learn how to load the median Renko bar for Ninjatrader and also the various functional tools that comes with it so you can customize the median Renko bar. Locate the file that you just downloaded (zip format) and import it. You can restart your Ninjatrader platform. An important note is that the median Renko bar for Ninjatrader cannot be found under indicators but under the ‘Price’ tab. Double click on the price chart to open the ‘Data Series’ window. Here use the dropdown and select AzInvestMedianRenko. Further customization includes selecting the Bar type (1, 2 or 3), the Brick Size (100 = 10 pips) and the Retracement factor (50 = 50%). Note: To get the regular Renko charts, you can change the ‘Retracement Factor’ to 100. The Renko charts you see here now also have the option to display the wicks. A factor which we noted was missing with the native Renko charts offered by Ninjatrader. 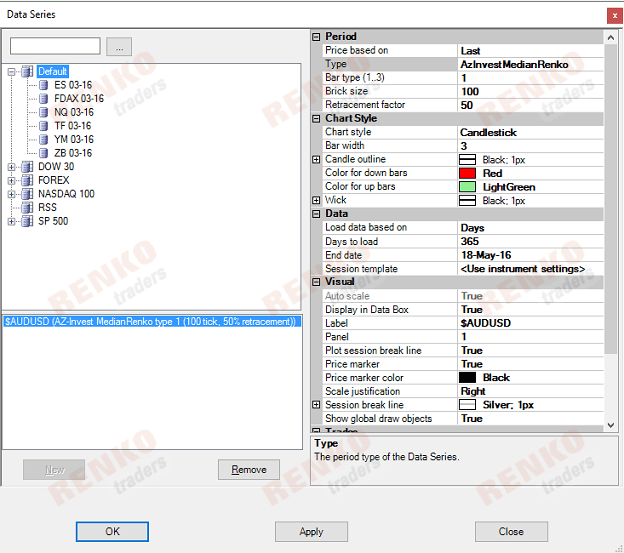 The Median Renko plugin for Ninjatrader offers many benefits especially if you trade purely based on Renko or median Renko charts. The plugin firstly allows you to customize the indicator, so you can switch between the median Renko bar with a retracement factor of your choosing, or just changing the retracement factor to 100 to get the traditional or regular Renko bars. While Ninjatrader provides native support for traditional Renko bars, they do have some shortcomings such as the fact that the wicks on the Renko charts are missing. Read more about the Ninjatrader Renko chart here. This is overcome by using the Median Renko chart plugin. The median Renko bar for Ninjatrader retails for $45. You can also request for a free 7-day trial to test drive the Median Renko bars for Ninjatrader. The free 7-day trial for Ninjatrader is fully functional thus enabling you enough time to test the Median Renko plugin and determine if it is right for you. To conclude, the Median Renko and Renko bar indicator for Ninjatrader Platform is a unique and well priced tool that you must have if you want to trade using Renko charts. The ease of use and the fact that you can use a free 7-day trial makes it easy and simple for you to test drive the Ninjatrader median renko chart plugin before you buy. Request a 7-day trial here!